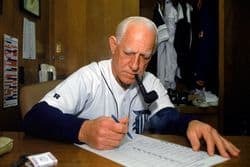 Former baseball manager George “Sparky” Anderson, a Hall of Fame coach who led both the Detroit Tigers and Cincinnati Reds to World Series titles, died on November 4, 2010 because of complications from dementia. He was 76 years old. Sparky was a truly-beloved sports figure who will be sorely missed, as described in this article from the Detroit Free Press. His death comes during National Alzheimer’s Disease Awareness month. Dementia is most often caused by Alzheimer’s disease and is a growing epidemic in our country. In fact, every 70 seconds, someone else in America develops Alzheimer’s disease. It now affects over 5.3 million Americans. When families have a loved one with Alzheimer’s disease or other forms of dementia, good estate planning becomes even more important. Often, people with early stages of dementia can still do the proper legal planning and protect their financial affairs. Other times, seniors with Alzheimer’s or similar conditions are targeted by unscrupulous family members, caregivers, or others who improperly influence them to change their wills, trusts, bank accounts or other assets. To help promote awareness of Alzheimer’s disease and educate families about estate planning, including ways to protect the legal affairs of those affected by dementia, Andrew and Danielle Mayoras have teamed up with FOX 2 Detroit, the Alzheimer’s Association – Greater Michigan Chapter, and The Center for Elder Law to present A Morning to Remember. This educational and entertaining breakfast will be held at the Southfield Public Library, on Friday, November 12, 2010 at 9:30 a.m., and is open to the public, at no charge.